I am brand new to this site and am hoping that one of your experts can help me out. 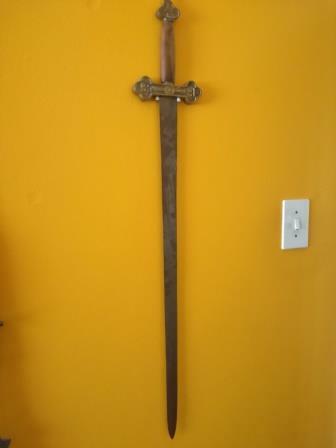 Is anyone able to tell me anything about this sword? It is +- 1 metre long and has a solid brass pommel and guard. The guard itself is very thick and has the letters S & I (or it could be a Roman I, I am not sure) on the ends of the guard and one both sides of it. It looks hand made and to be honest either the handle/grip has been reattached at one time or it was made by an apprentice. Your expert help will be greatly appreciated. Looks like a Masonic or some other kind of fraternal society sword. I'd guess late 19th, early 20th century based on the style. There was (still is) a fraternal organization called the Sons of Italy. Which abbreviates itself, reasonably enough, SI. I've never seen one their swords, but I would start looking there, as that is almost certainly a Fraternal Sword. Maybe if it's a much more modern sword? I don't know if it's changed, but the Sons of Italy swords I've seen have OFDI on them, for Ordine Figli D,Italia . . . the proper Italian name of the organization. If it is Sons of Italy, it'd also seem odd that a ceremonial sword from an American organization, that's only been around since 1905, would end up in South Africa? I'm not saying it couldn't, but that seems a bit unlikely. Organizationally I'd lean more towards some other Fraternity. It does have a pseudo Masonic triangle on it. Something about the sword, though, just seems off. Maybe it's the kind of nut on the pommel that's holding it together? It looks extremely out of place. I'm curious if it's some kind of cheap rat-tail knock-off that's been forcibly aged? After all, Ms. James does imply some level of shoddy feeling in the grip. Has the sword been taken apart and inspected at any point? Where and when was the sword acquired? I'm certainly no expert, but figured I'd throw in my 2 cents, as it just feels "off" to me. It is not an American fraternal pattern. Wow - you gentlemen are brilliant - thank you!. I have just emailed the Sons of Italy in New York to see if they can shed more light on the sword for me. I am actually British and living in South Africa but about to go back to the UK in one months time. I bought the sword a good while ago from an online auction for my middle son who loves all parts of history. I have just discovered that the UK now has very strict import controls on what they call "offensive weapons" and unless I can prove that the sword is either a fraternal sword or is over 100 years old, the UK authorities will not let it in. (I have a similar problem with two Hollywood swords that he also has. They are part of a limited edition from 20th Century Fox but I am worried that the UK authorities will not let them in either!!). I will keep you updated on what the Sons of Italy say and thank you once again. The problem with all sword legislation is that it is impossible to create a definition of "sword" that distinguishes between weapons, wall hangers, theatre props, and sporting implements. When my state was proposing such legislation I sent in a submission requesting this definition. They later sent me a response stating that the legislation had been scrapped because they couldn't agree on an acceptable legal definition of "sword". I've seen very similar - if, honestly, less crudely made - things on Kult of Athena and other vendors, all of which claim to be based on 18th-19th Century Masonic swords. For example. The mismatched grip and pommel nut in particular make me think this is not an actual fraternal sword, but much more likely either a modern Indian decorative piece AND/OR possibly a theatrical prop made by combining parts from a couple of different decorative pieces. Your analysis seems reasonable to me! I just knew guy who was in Sons of Italy when I was a kid, and the sword certainly resembles a fraternal sword. But as I said, I've never seen one. You have. I'd take your opinion over mine any day. Also, sword origin in South Africa suggests it's probably NOT a Sons of Italy sword. I maf=de teh mistake of assuming the poster was American, without good reason!.